Understanding the exchanges of energy, water, and carbon dioxide between the atmosphere, land, and plants provides a basis for understanding elements of weather, climate, and agriculture. Studying the turbulence, or eddies, in and around the canopy of trees is helpful in piecing together this understanding. A group of researchers from several universities and government agencies undertook a canopy-turbulence study that generated huge amounts of data, giving them plenty to study in their various disciplines and contributing greatly to the knowledge base in this area. This study, carried out by the Earth Observing Laboratory (EOL) of the National Center for Atmospheric Research (NCAR), is one of a series of horizontal array turbulence studies (HATS). The array consists of 18 Campbell Scientific CSAT3 3-D Sonic Anemometers, Campbell KH2O Krypton Hygrometers, carbon-dioxide sensors, and various other environmental sensors, all mounted at precise intervals on a horizontal frame. The CSAT3 provides precision, three-dimensional turbulence measurements, with a body and frame designed for minimal flow distortion. 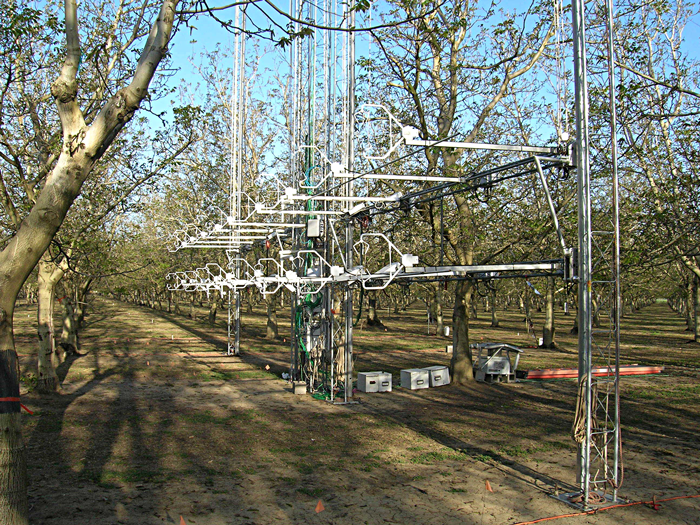 This array has been used for turbulence studies on the ocean (OHATS) and in fallow fields (AHATS), and for this study in a walnut orchard (CHATS). The principal goal of the HATS studies is to investigate the interaction between small-scale and large-scale eddies in order to test and improve the sub-filter-scale closure models used in large-eddy simulation of turbulent flows. In addition to the horizontal array, for the CHATS project the researchers included a vertical array on a 30 m tower, using 13 CSAT3 anemometers, 6 KH2O hygrometers, and many other sensors. In the walnut orchard, the arrays were first used to gather turbulence data with no leaves on the trees, then during leaf-out, and finally when the canopy was fully developed. The arrays also measured water vapor, carbon dioxide, air temperature and humidity, solar radiation, leaf temperature, and turbulent pressure fluctuations. Sometimes more than one type of sensor was used to measure the same thing, providing comparative data for researchers. Also, the horizontal array could be raised and lowered to take measurements within and above the canopy. These arrays of sensors, in such a variety of locations and with so much measurement time, have provided a very large data set that can be used to confirm and enhance numerical tools and models linking turbulence and various elements of weather, climate, and plant growth.